Responsive Magento themes to create an online store with the new trends in design. All themes & templates come-up with flat design and would be perfect choice for any eCommerce websites, especially fashion, jewelry, wedding or mobile website. Furthermore, all themes are equipped with a lot of useful extensions and over highly customizable static blocks. That’s all you need to totally control your store. Magento themes will be the best website ever, stable quality, high speech, easy to use functions and many more powerful features you can find in every theme. This is a beautiful collection of new Responsive Magento themes with a unique designs. All themes have so much features which makes your work easier to run your powerful eCommerce website. Magento ecommerce solution has become the most demanding open source platform of today’s online retail store businesses since it provides a tremendous advantage. With Magento eCommerce Themes, online store owners are being given the capability of handling multiple stores and facilitate a more systematized browsing of items for sale. Magento is total control and Magento Themes are best solution of eCommerce Websites. Here is the list of fresh high quality responsive Magento themes design for eCommerce Websites / Stores. Optima magento theme is a great choice for you. 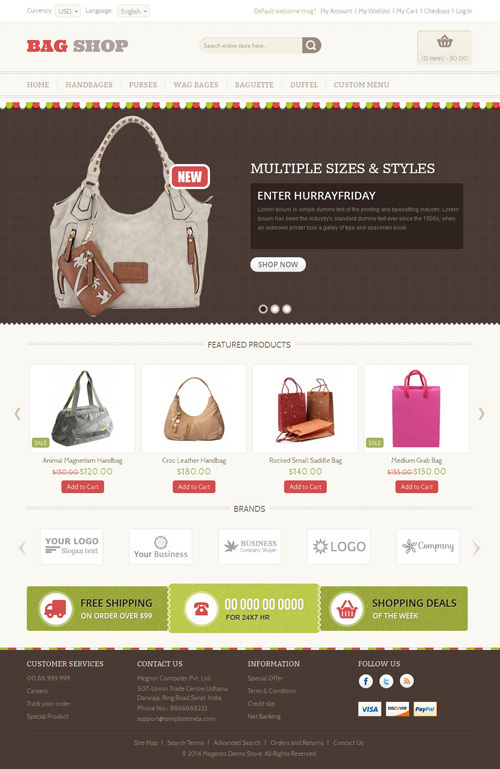 Optima is a multi store magento theme of Plazathemes. Optima theme is simple web design and include amazing, mega menu with nice images, homepage slideshow, social networking icons, static blocks with beautiful images, css3 and bootstrap technology. Pajuh is a stunning, clean and fresh Magento templates. This templates easily fits for any kind of shop demographics. Aside from just looking beautifully polished and clean, it comes packed with features and options, powerful Magento Framework, 4 color options, a slideshow module, easily configured various modules positions, a newsletter extensions, and a lot other best and selected extensions . Shopcrown is a premium responsive and retina ready magento theme with clean, modern and elegant design. Shopcrown has features to help customize the interface your website easily without need to customize html, css. Shopcrown is also featured with many other powerful trends and admin settings. MAGMA Fashion Magento template is a clean designed, customizable colors, fonts with admin option. Features rich with powerful slideshow admin module, 2 main menu styles, New products slider home page,Featured Products, Upsell product slider, price slider filter, ajax layer navigation, Dropdown shopping cart, Lastest twitter widget, thumbnail images slider, Pro zoom product Images extra links and blocks and so on. Lyra fashion magento theme is a new design of Plazathemes. This theme adapts automatically to your tablets and mobile devices. Lyra template supports translation into more languages. This theme has 4 templates : ma_lyra template with not full width slideshow, ma_lyra_wide template with full width slideshow, ma_lyra_left template with 2 columns left layout, ma_lyra_right template with 2 columns right layout. You can choose one in 4 templates to become your store.